Handling industrial forklift truck batteries can be a hazardous task. It is important that management offer personal protective wear and personnel take precaution by utilizing the personal protective wear. 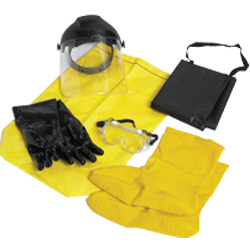 Wearing the items in the BHS Personal Protective Kit provides added safety while watering and changing batteries, as well as cleaning and neutralizing battery acid spills.